March 4, 2014 /LGBT News/ Immersing himself in alternate lifestyles and long, hilarious experiments, writer A.J. 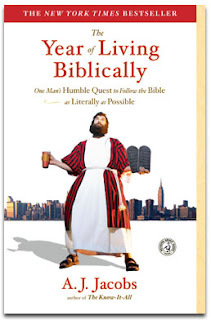 Jacobs tests the limits of behavior, customs, culture, and knowledge with the year he spent living biblically -- following the rules in the Bible as literally as possible. "At the beginning of the year, I wrote down every rule, every guideline, every suggestion, every nugget of advice I could find in the Bible. It's a very long list. It runs 72 pages. More than 700 rules," Jacobs says. He vows to follow the Ten Commandments. To be fruitful and multiply. To love his neighbor. But also to obey the hundreds of less publicized rules: to avoid wearing clothes made of mixed fibers; to play a ten-string harp; to stone adulterers. "First, since the Bible requires me to tell the truth (Proverbs 26:28), I must confess that part of the reason is to write this book. A couple of years ago, I came out with a book about reading the Encyclopaedia Britannica, all of it, from A to Z — or more specifical, from a-ak (East Asian music) to Zywiec (a town in southern Poland known for its beer). What could I do next? The only intellectual adventure that seemed a worthy follow-up was to explore the most influential book in the world, the all-time best seller, the Bible. Second, this project would be my visa to a spiritual world. I wouldn't just be studying religion. I'd be living it. If I had what they call a God-shaped hole in my heart, this quest would allow me to fill it. If I had a hidden mystical side, this year would bring it out of the closet. If I wanted to understand my forefathers, this year would let me live like they did, but with less leprosy. And third, this project would be a way to explore the huge and fascinating topic of biblical literalism. Millions of Americans say they take the Bible literally. According to a 2005 Gallup poll, the number hovers near 33 percent; a 2004 Newsweek poll put it at 55 percent. A literal interpretation of the Bible — both Jewish and Christian — shapes American policies on the Middle East, homosexuality, stem cell research, education, abortion — right on down to rules about buying beer on Sunday." There was only One Who was sinless, but a true seeker who was sought out, will have a new heart and will want to sin-less. without a new heart, we do not understand God's. He is Holy and nevertheless also commands us to be..